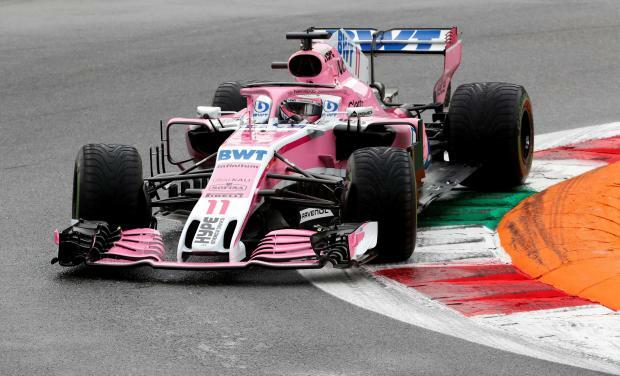 Force India's Sergio Perez led the way in a wet first practice for the Italian Grand Prix on Friday with Formula One title contenders Lewis Hamilton and Sebastian Vettel giving the fans only glimpses of their cars. Mercedes' championship leader Hamilton, 17 points clear of Vettel ahead of Ferrari's home race, completed six laps in the 90-minute session and was only 11th while his German rival did four and was 17th. His comparatively slow time was 0.550 quicker than Ferrari's Kimi Raikkonen, with Force India's Frenchman Esteban Ocon third on the timesheets. Toro Rosso's New Zealander Brendon Hartley was fourth, reflecting the unrepresentative nature of the session since he has scored only two points all season, with Australian Daniel Ricciardo fifth for Red Bull. Ricciardo, who is using an upgraded Renault engine, is set to take engine penalties that will send him towards the back of the field in Sunday's race. With heavy rain lashing the 'Pista Magica' before the start of the season, but better conditions expected for qualifying and the race, there was little the top drivers could gain by venturing out. "The problem is we are limited on the wets and inters we have for the weekend, so there are no guarantees this weather won't hang around for tomorrow," Red Bull team principal Christian Horner told Sky Sports television. "So you're going to see fairly limited running today." The Briton's times were close to those of regular race driver Fernando Alonso when both were on track in similar conditions, however.